If there was only one word to describe the works in this exhibition, it would be this: big. 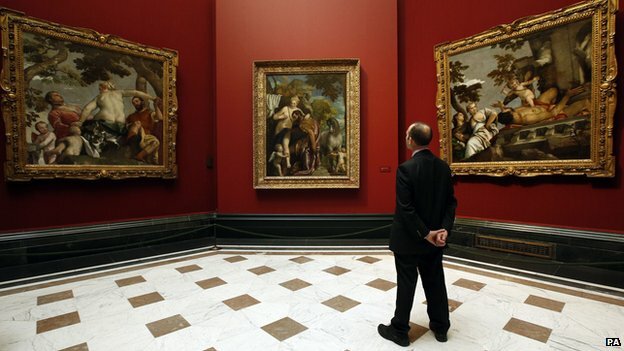 The National Gallery’s Veronese: Magnificence in Renaissance Venice brings together 50 paintings by the wonderful Paolo Veronese in the UK’s first ever monographic exhibition of the artist. And boy, did they do an impressive job! Unfaithfulness and Scorn flank the lovers Mars and Venus. Image via www.bbc.co.uk. Upon entering the first room, we immediately become witnesses to The Supper at Emmaus (about 1555), flanked by the pendant family portraits of Iseppo da Porto and his wife, Livia Thiene, with their son and daughter. But do not fret; there are other onlookers within the four-metre wide painting. A young girl to the right looks out towards us, while at the bottom-left we can see Christ accompanied by the same two disciples in the foreground. In the corner, inscribed in gold leaf, are the words “PAOLO VERONESE”. This painting forms part of an oeuvre where family groups are inserted into religious scenes. We find the same treatment with his patrons in the Conversion of Mary Magdalene (about 1548). 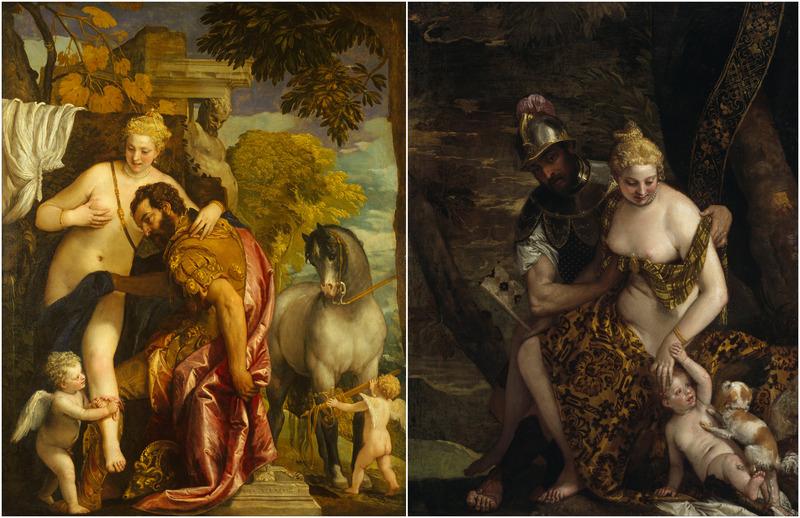 Veronese’s early style was heavily influenced by classical antiquity. His religious and mythological scenes are littered with classical ruins and architectural settings, perhaps making reference to the Biblical past and the Old Kingdom, such as in the Anointing of David (about 1550). Paolo Veronese, The Anointing of David, about 1550. Image via www.wikipedia.org. Born in Verona in 1528 – eight years after Raphael’s death – it is almost inevitable to see the influence of Raphael in his works, especially since the latter’s principle studio assistant, Giulio Romano, was one of his contemporaries. 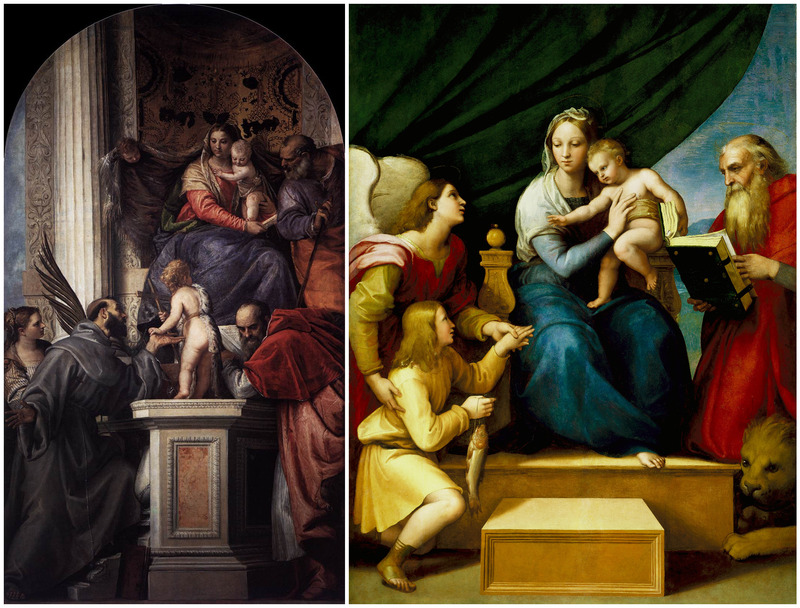 I couldn’t help drawing comparisons in my head between the Virgin and Child with Saints (Pala Bonaldi) (about 1562) in the third room with Raphael’s Madonna of the Fish (1512-14) in Madrid. We know he based his composition of the Dream of Saint Helena (about 1570) on an engraving by a follower of Marcantonio Raimondi after a drawing by Raphael, so it is plausible for Veronese to have seen the engraving of the Madonna of the Fish by either Marcantonio himself or his pupil Marco Dente. Raphael’s engravings were much appreciated by Venetian artists including Titian. Paolo Veronese, Virgin and Child with Saints (Pala Bonaldi), about 1562; Raphael, Madonna of the Fish, 1512-14. Images via www.wikipedia.org. The sheer size of Veronese’s paintings really do catch one by surprise, especially if you follow the guide into the small room of elegant portraits, and then back out again in a crescendo of altarpieces made during the time he was living in Venice, the star being the Mystic Marriage of Saint Catherine (about 1565-70) for the high altar of the church in the convent of Santa Caterina. However, on the opposite side of the room were a set of rather untypical paintings, made to decorate a pair of organ shutters. As a result, you can see a clear vertical line in the middle of Saints Germinianus and Severus (about 1560), now joined together as a single painting. However, the altarpieces just get bigger and bigger! Look at that cute little lamb below Saint John the Baptist! Image via www.taboofart.com. Thrown right into our faces in Room 4 is the Martyrdom of Saint George (about 1565), reaching over four-metres high for the high altar of San Giorgio in Braida, Verona. This is theatricality at one of its peaks – appropriately, the theme of the room – bringing with it the gracefulness of Raphael, the drama of Michelangelo, and the overall feeling of Titian and the Venetian tradition. The impact of this imposing painting resonates throughout the entire room, even before you enter the doorway where you can properly see the full painting without glaring. I almost felt sorry for the smaller, secular Finding of Moses (about 1575-80) on the opposite wall, whose detail was just as extraordinary as its larger counterparts. 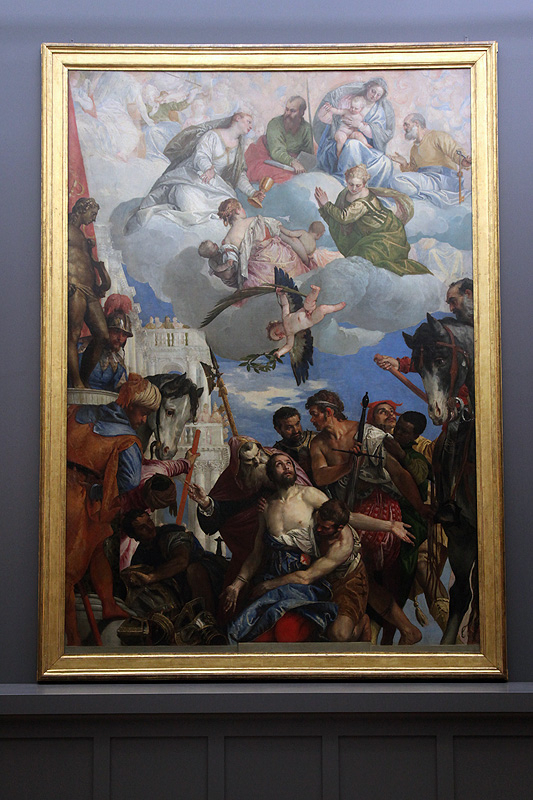 Paolo Veronese, The Martyrdom of Saint George, about 1565. Image via www.theupcoming.co.uk. Walking past the two Dream of Saint Helena paintings I bore witness to a reunion that excited me just as much as the Venus of Urbino-Olympia reunion back in Venice last year at the Palazzo Ducale, or even the two Virgin of the Rocks in the hugely successful Leonardo show that brought visitors to camp outside in the early mornings just for a ticket – I was one of them. 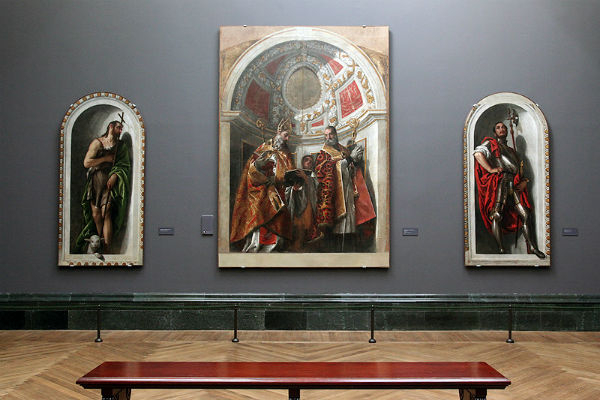 On one wall was the National Gallery’s Adoration of the Kings (1573); in opposition was the later Adoration of the Kings (1573-4) from the Church of Santa Corona in Vicenza. The former is of a square format while the latter is of a typical arched altarpiece. Both show remarkable similarities in their composition – the ray of light, scaffolding, use of architectural setting, even the servant boy dressed in white in the foreground. 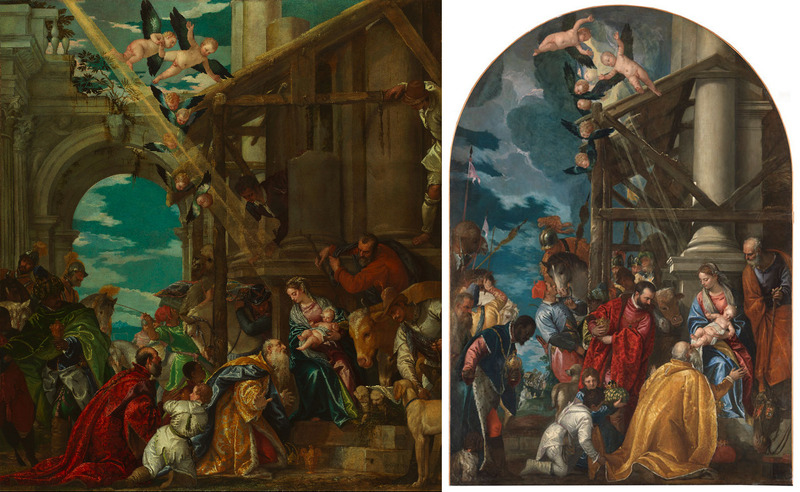 Shown together for the first time since leaving the artist’s studio, it demonstrates Veronese’s use of a standard design, making alterations for different patrons, such as the coat-of-arms in the Santa Corona altarpiece which refers to the Cogollo family. I spent about 10 minutes swivelling from side-to-side and making comparisons. And then came another beautiful surprise. The two Adoration of the Kings, reunited after 500 years. Images via www.wikipedia.org; www.arttattler.com. Standing in the middle of the octagonal room – literally – I was surrounded by the Four Allegories of Love (about 1570-5), consisting of Unfaithfulness, Scorn, Respect and Happy Union. The gallery assistants probably thought I was crazy as I twirled around in admiration to see these four paintings hung in close proximity, rather than across the corners of the large rectangular room of Venetian paintings. They were originally made to decorate a ceiling, which explains the odd perspective of the works. To heighten the theme of allegories and mythological paintings, specifically that of love, a small display case presents us with a beautifully small Mars and Venus (about 1575-80) from the Galleria Sabauda in Turin, hilariously depicting the god and goddess intruded by Cupid leading a stallion down the spiral staircase. Paolo Veronese, Mars and Venus United by Love, about 1570-5; Venus, Mars and cupid, about 1580. Images via www.wikipedia.org. During Veronese’s later years, he had an increasing reliance on his studio assistants, which included his two sons Carletto and Gabriele. The paintings in the final room appear darker in their settings, becoming more secular in appearance, such as the Agony in the Garden (about 1580-3). Standing in the doorway, I couldn’t help but attempt comparisons between the Venus, Mars and Cupid (about 1580) in this room and the Mars and Venus United by Love (about 1570-5) in the previous room. At the end of the room was Veronese’s last known work, the Conversion of Saint Pantalon (1587), made for the high altar of the church of San Pantalon in Venice, before dying from a fever on 18th April 1588. This is one of those rare exhibitions where large altarpieces from a variety of churches have been permitted to unite in a retrospective of a highly appreciated artist. This show truly brings out the best of Veronese, from his mastery of dramatic compositions to his skill at engaging the viewer with a fine mix of both baroque and classical styles. Highly recommended, and certainly worth the walk back up the stairs from the ticket office. Veronese: Magnificence in Renaissance Venice runs until 15th June 2014 at the National Gallery, London, www.nationalgallery.org.uk.